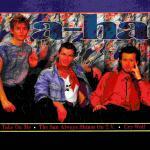 There are many 'unofficial' or 'bootleg' a-ha releases. This section aims to give some basic details and pictures of some of these unofficial releases. The list is by no means exhaustive and with new releases (especially compilations) being released on a fairly regular basis, it is almost impossible to track them all. Some of the more 'interesting' unofficial releases will be listed here. Track listings below include any spelling mistakes printed on the releases, often these mistakes can be a give away that the release is unofficial! 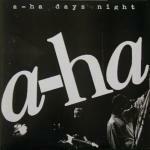 This American made double-LP has a black and white cover with "a-ha days night" in white typewriter letters at the top and the original a-ha logo across the cover. 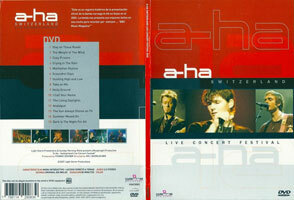 It features live songs from a-ha's concerts at the Hammersmith Odeon in London, UK on 16th December 1986. Underneath there are three very dark photos of Magne, Pål and Morten, probably taken from the official tour programme. The back cover has a large promo photo of the three guys and the songs are listed. Tracks: Train Of thought / Love Is Reason / Living A Boys Adventure Tale / Cry Wolf // The Blue Sky / The Sun Always Shines On T.V. / Driftwood / Here I Stand And Face The Rain / We're Looking For The Whales / And You Tell Me / Hunting High And Low // I've Been Losing You / Scoundrel Days / Take On Me. This double-LP has a brown toned cover (Paul, Mags, Morten), similar to the cover of the 86/87 tour programme with the a-ha logo in large white letters at the tour and "world tour 86 87" in smaller white letters underneath. The back sleeve is white with a brown toned shot of the band in the centre (similar to that seen on the cover of the Hunting High And Low single). The tracks are listed at the bottom of the sleeve. 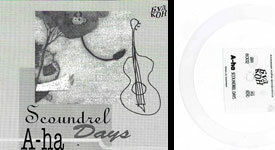 Some of the titles are incomplete and "Scoundrel Days" is listed as "Scandal Days". Tracks: Train Of thought / Love Is Reason / Living A Boys Adventure Tale / Cry Wolf // The Blue Sky / Manhattan Skyline / The Sun Always Shines On T.V. // Driftwood / Here I Stand And Face The Rain / We're Looking For The Whales / And You Tell Me // Hunting High And Low / Dream Myself Alive / Scoundrel Days / Take On Me. This double-LP by Nurve Records Ltd, 182 Kingsberg Road, London SW3 was made in England. This release features a concert recorded on June 29th 1987 in Osaka, Japan and credits several people for its production and release. 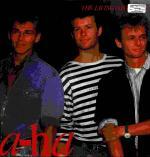 The cover features a picture of a-ha taken from photo session of the presentation of "The Living Daylights". The reverse of the sleeve features two live photographs with green text over the top, including the track listing (complete with mistakes, such as "Taxi" (Touchy!) and track 3 on side two (The Swing Of Things) has not been listed at all!). The sound quality of this album isn't too great, but a slight improvement on "Take On a-ha". One problem, however, is that the pressing has a slight defect and the record runs too fast even at 'correct speed' of 33 1/3 RPM. Tracks: Cry Wolf / Maybe Maybe / Here I Stand And Face The Rain / Manhattan Skyline / The Sun Always Shines On T.V. / Scoundrel Days / We're Looking For The Whales // The Weight Of The Wind / Hunting High And Low / Taxi / Take On Me // The Living Daylights / I've Been Losing You / And You Tell Me. The cover of this live LP has "TAKE ON A-HA" printed in light blue letters across the top of this white sleeve. Two lines, in the same blue as the title have been printed underneath the title and towards the bottom of the sleeve. A picture of the band (Pål, Magne and Morten), taken from the same photo session as that on the "Take On Me" cover, has been printed on the skew in the middle section of the sleeve. The reverse cover repeats the title and the blue lines, but text replaces the band picture. The text includes track list, date and venue (Hammersmith Odeon, London 18th December 1986), details of the band (including Dag Kolsrud (keyboards), Michael Sturgis (drums) and Leif Karsten Johansen (bass guitar)), it also states that the LP is a promotional copy not for sale !. The sound quality is not too great. Tracks: Train Of Thought / Cry Wolf / The Blue Sky / The Sun Always Shines On T.V // And You Tell Me / Hunting High And Low (acoustic version) / I've Been Losing You / Scoundrel Days / Take On Me. The Indonesian Cassette of "Hunting High And Low" has a white sleeve featuring a unique shot of the band (Morten, Magne and Paul). The a-ha logo is printed in coloured letters at the top with the title in white on black and red strips below. It is thought that this is an unofficial release. This singapore made cassette include the Hunting High And Low album plus 5 songs by "BELOUIS SOME", released under the label "747". The cover is similar to the regular release of Hunting High And Low, but some of the tracks are listed incorrectely and the Belouis Some tracks are added in the middle! The year of release is not printed on the cassette. Tracks: Take On Me / Train Of Thought / Hunting High And Low / The Sky / Living A Boy's Adventure Tale / Some People (by: BELOUIS SOME) / Tail Lights (by: BELOUIS SOME) / Target Practice (by: BELOUIS SOME) / Stand Down (by: BELOUIS SOME) / Imagination (by: BELOUIS SOME) / And You Tell Me / Reason / I Dream Myself Alive / Here I Stand And Face The Rain / The Sun Always Shines On T.V. The cover of this Korean only "Best Of" release is gold coloured with "AHA" printed in large letters across the top. Within these letters you can see the faces of the band members (Morten, Pål, Mags); taken from the cover of the "You Are The One" single release. The pictures are numbered "No1", "No2" and "No3" respectively and the names of band members are printed in red up the inside of each letter (Morten's name is printed incorrectly as Morton). It's not thought to be an official release and editions with various different 'catalogue numbers' seem to exist e.g. DRC-317 (MDRD-177) and MDRC-1090 (TBC). The reverse of the insert is light brown with "AHA" in very large similar coloured letters in the centre. The back insert is also light brown with a large, slightly lighter "AHA" in the centre. The track listing is printed in white in yellow. 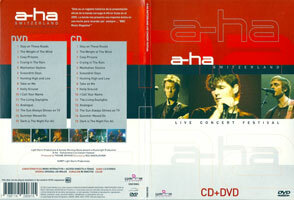 The spines of the inserts are red and pink with title "A-hA/THE BEST" in white. The disc is silver with blue text. There is no publishing year printed in this release. The Korean only "Best Of" LP comes in an attractive picture sleeve showing the band (Pål, Morten, Magne) sitting in front of a patterned curtain. The a-ha logo in large blue letters has been printed across the top of the picture. Some of the tracks are listed in red underneath the picture. The cover of this unofficial release features the picture as found on the reverse of the "Headlines And Deadlines" album. A grey "a-ha" logo and pink title has been printed on the picture. The CD insert folds out exposing a black and white a-ha photo (as found in the "Memorial Beach" booklet). The actual CD is silver with black text and pink "greatest hits" title. The album has the same track listing as "Headlines And Deadlines" album, but two additional tracks, "Memorial Beach" and "Lie Down In Darkness", have been tagged on the end. Although these tracks are last on the disc, they have been listed incorrectly on the sleeve as being before "The Sun Always Shines On The TV". One of the give aways that it is an unofficial release (apart from the unprofessional look of the sleeve / disc design) is the fact that there is no mention of a record company or the country of manufacture! It is believed that this release was available in Bulgaria. Tracks: Take On Me / Cry Wolf / Touchy! / You Are The One (remix) / Manhattan Skyline / The Blood That Moves The Body / Early Morning / Hunting high And Low (remix) / Move To Memphis / I've Been Losing You / The Living Daylights / Crying In The Rain / I Call Your Name / Stay On These Roads / Train Of Thought (remix) / The Sun Always Shines On T.V. / Memorial Beach / Lie Down In Darkness. This Indonesian made 22 track "Billboard" compilation cassette even contains tracks such as "Stop! And Make Your Mind Up" and some extended mixes. The extended version of "The Sun Always Shines On TV" is the U.S. Steve Thompson Dance Mix and the "Cry Wolf" extended version is the regular extended mix, but is faded out earlier. The cover is divided into two colours - the top right hand section is light blue and the bottom left is light green. The colours meet in a diagonal line across the middle of the sleeve. In the bottom right hand corner is a picture of the band (Morten, Pål and Magne). Above the picture is the title in bold black letters plus the "Billboard" logo. Coloured triangles and red lines of various sizes add to the background design. Almost definately an unofficial release, this Russian album "Minor Earth, Major Sky + Bonus Tracks" is a picture disc which features the aeroplane cockpit picture as found on the cover of the official "Minor Earth, Major Sky" album. Underneath this picture, the title is printed in red bold text. The "bonus tracks" are: Crying In The Rain (4:19), Take On Me (3:40), Early Morning (2:57), Hunting High And Low (3:47) and Take On Me (6:06). The following text is printed on the sleeve: 2000 Invisible HOLAHUP record gmbh a warner music group company. Made in Germany by WARNER MUSIC MANUFACTURING EUROPE. The cassette itself is transparent blue. 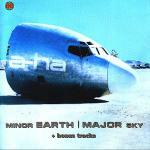 The cover of this compilation album features a picture of the band sitting in an open top car which was taken from the "Minor Earth, Major Sky" album booklet. a-ha is printed in white letters in the bottom right hand corner of the sleeve with the title printed in gold coloured letters below. The disc is a picture disc, of similar design as the front sleeve. It is thought that this album was produced in the Ukraine, but it actually states EMI United Kingdom (Lighthouse Records). All featured tracks are album versions except "You Are The One" which is an edit version and "Move To Memphis" which is the single version. "East Of The Sun" is listed as "East Of The Sun & West Of The Moon". The total running time is 78:39. Tracks: Summer Moved On / Take On Me / You Are The One / Touchy / Love Is Reason / Minor Earth Major Sky / Cry Wolf / Manhattan Skyline / Crying In The Rain / You'll Never Get Over Me / East Of The Sun / Move To Memphis / Early Morning / The Sun Never Shone That Day / The Living Daylights / Slender Frame / I Won't Forget Her / I Call Your Name. This 19 track best of collection by "Tornado records" features a picture of a hot air balloon in a cloudy sky with 4 a-ha group shots in the foreground and a yellow stripe pattern across the middle. The a-ha logo is in orange above with the title in white across the middle. The back sleeve features a shot of a white, orange and yellow hot air balloon seen from above / below. 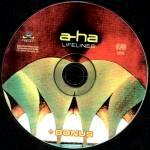 The disc is multi-coloured (orange, yellow, white, blue) with the a-ha logo in orange at the top and the title in white below. This "Greatest Hits Collection" features 17 tracks. The cover is white with a picture of the band taken back in 1988. Around the edge of the picture it reads "A-HA - PLATINUM COLLECTION '2001 - Greatest Hits - PLATINUM COLLECTION '2001" in red and black font. The reverse of the sleeve is white with a shot of a-ha taken from the "Touchy!" video. The track listing is printed in black and the title in red and black. The disc is white and blue with the title printed in a blue star. 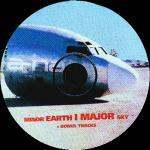 As with "Minor Earth, Major Sky" there was a Russian release with bonus tracks. The cover is similar to the regular release, but brighter red in colour and with "+ BONUS" printed in yellow letters towards the bottom of the sleeve. The back sleeve differs from the regular release with a different picture and fonts. The disc is a picture disc, similar to the front sleeve of the album. The bonus tracks are: Minor Earth Major Sky, Angel In The Snow, Little Black Heart and You'll Never Get Over Me. There is another "Lifelines" album with bonus. This one claims to be German made and includes "Summer Moved On" (4:37), "Velvet" (4:19) and "Minor Earth, Major Sky" (5:24) as extra tracks. The cover is much the same as the regular German release, but the bonus tracks have been tagged on the end of the track list in white (other tracks are listed in red). This item is believed to be unofficial and doesn't have a catalogue number. This "Lifelines + bonus" release by Panda Music was found in Asia, but claims to be made in the EU. It doesn't have a catalogue number as such, but there is a barcode with number on the reverse. The front cover is similar to the official releases, but has "+ bonus" printed under the title and the "Panda Music" logo in the bottom right hand corner. The back sleeve has the track list printed down the left hand side and again the Panda Music logo is in the right hand corner. The a-ha logo is a greenish yellow colour. The rest of the artwork and disc differ quite a lot compared to the official releases and features some early shots of the band plus information. The disc is similar to the front sleeve, but has an old band shot super-imposed on the design! The bonus tracks are Early Morning, Take On Me (radio version), Summer Moved On and Minor Earth Major Sky. Another, "German made" release which was found in Asia has a similar cover to the official release, but on the back sleeve the 3 bonus tracks (Summer Moved On (4:37), Velvet (4:19) and Minor Earth Major Sky (5:24)) have been appended to the bottom of the track list in a colour which doesn't quite match the rest of the list (the extra tracks are more pink than red!). Also the text "+3 bonus" has been printed on the spines in pink. The CD insert is similar to the regular release, but some of the pictures have been printed in black and white. Yet another "unofficial" release of "Lifelines" found in Asia. This one doesn't have any bonus tracks. The front sleeve is similar to the official releases, but the insert, back sleeve and disc differ. The back sleeve has the track list in white and is made to look like it is glowing as the text is very blurred. The disc is similar to the front cover of the album. Apparently this album was released by "Capitol Music" and has a unique catalogue number. CD Russia Lifelines + bonus ? 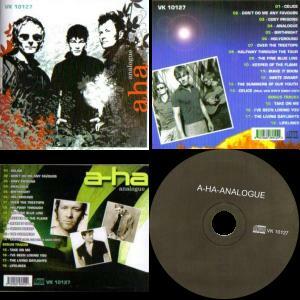 This unofficial collection of 16 a-ha remixes has a similar cover to the "Lifelines" 'red' European single release. Compared to the front cover of the European single, the arches pictured on the front are more close-up so that the steps cannot be seen. The title is printed in dark letters on a white strip under the a-ha logo and "b-sides, rarities & remixes" is printed in white in the bottom left hand corner of the sleeve. The reverse and inside of the insert features more shots of the red arches. The track list is printed in white on the reverse of the insert. Inside the insert there is quite a long paragraphy giving a brief 'history' of the band. The back insert features a very stretched shot of the arches. There is a white rounded rectangular in the centre on which the tracks lists are printed. The insert claims that it is a Universal Island Records, Made in the EU although the e-mail address given is a Russian one! 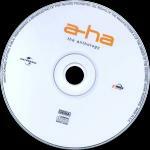 The disc itself is white with light orange a-ha logo and black text. 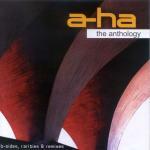 This unofficial release has the same track list as "a-ha the anthology", but has different artwork. The front cover is of similar design to the green "Lifelines" single, but has three black and white shots of the band members printed over the top. There is a white a-ha logo in the top right hand corner and the title in red in the bottom left. The inside of the insert features blue artowrk, like that used for the "Minor Earth Major Sky" single with a black and white shot of the band plus additional text. The CD is a pictures disc, again with the "Lifelines" art work and a picture of the band at the bottom. 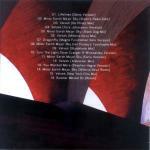 The back sleeve also features the "Lifelines" artwork and has the track list printed in red down the left hand side. Note that "Dragonfly" is printed incorrectly as "Oragonfly". CD EU Universal Island Records CID8122/063228-2/ LC00407/BIEM/MCPS? 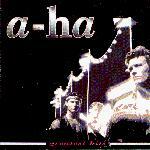 A German made collection of tracks by a-ha plus one track by Morten Harket! The cover features a shot of the band from 1988 on a white background. "Music Heritage" is printed in white letters on a blue strip along the top. The track listing on teh reverse features some mistakes such as Through That It Was You and I Whish I Cared! This bootleg compilation features 14 demos and unofficial mixes. 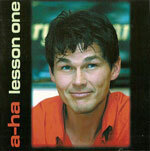 The front sleeve features a picture of Morten smiling, wearing a red shirt, the words "a-ha lesson one" in red and white text stretch from top to bottom. Inside the sleeve are individual shots of the other band members plus a shot of a blonde girl. The back sleeve is black with a shot of Morten plus track listing in white. The following text is also printed on the sleeve "Pictures (c)lgor http://www.a-ha.ru and yahoo UK message board. Sleeve design by Mr. Alex. Thanks to: Olivier for rare audio tracks. Please visit official site:http://www.a-ha.com or http://www.warnerbros.com Not For General Sale. For distribution within internet sales only. (p) + (c) 2003 Official Europe Fan Club under exclusive licence from Warner Brothers UK. The disc is black with a coloured shot of the band (Morten, Magne, Paul). The CD looks very unofficial and even the quality of some of the tracks is poor. This bootleg compilation features 16 demos and unofficial mixes. 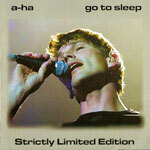 The front sleeve features a picture of Morten holding a microphone with the text "a-ha go to sleep" at the top and "Strictly Limited Edition" at the bottom. The back sleeve is grey with a live shot of Morten and track listing in red, pink, white and green. The CD looks very unofficial and even the quality of some of the tracks is poor. This 18 track compilation, apparently made by Warner Music Group GmbH, features the same cover band shot at The Singles 1984|2004, but the picture is in colour and the band are in front of a brown fence. "NORWEGIAN WOOD the best" has been printed below the a-ha logo and a scenic picture of Norwegian mountains has been preinted in the top left hand corner of the sleeve! The back sleeve features a shot of some trees silhouetted against the sky. The track list is printed in white on the left hand side. Inside the booklets is a shot of the band overlaid on a picture of some icebergs! The disc is black with a shot of the band at the bottom of the disc and the title at the top. Germany Norwegian Wood the best WEA ? This 19 track Russian best of compilation album is thought to be unofficial, even though it is being sold through an official Russian internet shop. The cover features a blue-tone shot of the band (Mags, Morten, Pål) on a black background. The a-ha logo and title are printed in cream letters, in the top right and bottom left corners of the sleeve respectively. Almost certainly a bootleg, this Malaysian release has a similar front cover to the regular European release, with the catalogue number printed in light blue letters in the top left corner. The back cover uses green "Lifelines" artwork with individual band pictures. Incomplete track titles are printed on the left hand side in white. Track 14 is Celice (Paul Van Dyk radio edit) and there are four bonus tracks: Take On Me, I've Been Losing You, The Living Daylights and Lifelines. The reverse of the front insert is blue with the tracks listed down the right hand side, plus black & white band shot in bottom left. The inside of the insert is white with some of the lyrics printed in light blue. The disc is brown with the title in white across the top. Although the artwork for this Russian digipak release is similar to the regular releases, it is thought to be unofficial as it is released on the illegal "Star Mark" label. There is a white stickered chip on the inside of the Sleeve and a white bar code sticker on the back. 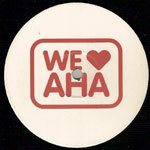 This one sided 12" record "We Love a-ha" features an unofficial sounding mix of "Take On Me" (6:48). The disc comes in a plain white sleeve and doesn't have a catalogue number. Another 12" "Eighties ripoff artists" comes in a plain black sleeve with a white "dancerecords.com" barcode label. Side A features "Love Is Like Oxygen" by The Sweet, remixed by Charles Feelgood. 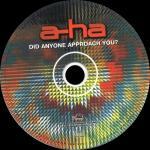 Side B features "Take On Me" (7:31) by a-ha, remixed by Dave Aude (2005). The discs have picture labels with the Fonz from Happy Days on side A and Arnold Jackson from Different Strokes on side B. Another unofficial 12" was released in the US on 7 July 2008 which features a remix. The disc comes with a small paper insert with cover artwork from the second release of "Take On Me" with the text "2008" and "Remix" overlaid! There are no labels on the disc. This Polish Flexi disc single is transparent with title and additional text in black. The cover is black and white with an abstract drawing which includes a picture of a guitar. The title is printed in black at the bottom. This release looks very unofficial! This Brazilian DVD was 'released' by Coqueiro Verde Records in 2009, it is thought to be unofficial. It features 12 live tracks (Celice / Move To Memphis / Stay On These Roads / Cosy Prisons / I've Been Losing You / Crying In The Rain / Hunting High And Low / Take On Me / Cry Wolf / I Call Your Name / The Sun Always Shines On TV / Analogue) from the Viña del Mar concert in Chile on 24 February 2006. The cover is black, covered with lots of small live photos of the band. The title is printed above in large white and blue/green letters. There is a pink jagged circle advertising that the DVD "INCLINDO TODOS OS HITS!" (includes all the Hits!). The back sleeve is black with white and blue title and white track listing and information. Three more live pictures are printed at the bottom of the sleeve. (p) 2010 Ecra Realizacoes Artisticas (Coqueiro Verde Records) Industria Brasileira - Produzido e Distribuido no Polo Industrial de Manaus por Sony DADC Brasil CNPJ 07.305.913/0001-65, Av. Buriti n.o 2.855. Manaus/AM. sobencomenda da Ecra Realizacoes Artisticas Ltda (Coqueiro Verde Records) CNPJ: 28.124.659/0001-79 Av. das Americas. 700 - Bloco 2 - Sala 331 - Rio de Janeiro - RJ - ATENCAO: o proprietario dos direitos autorais licenciou o filme contido neste DVD unicamente para uso domestico . Fica proibido qualquer outro uso, copiagom, reproducao ou execucao em publico quer seja integral ou parcialmente. Os infratores estao sujeitos as penaslidades da lei. O prazo de validade do disco DVD e indeterminado, desde que observados os seguintes cuidados basicos: armazenar em local seco, livre de poeira, nao expor ao sol, nao riscar, nao dobrar, nao engordurar, nao manter a uma temperatura superior a 55 graus celsius e umidade acima de 60 G/M3 e segurar o disco sempre pela lateral e pelo furo central. Also Displayed at the Bottom of the Back Cover is the 'Coqueiro Verde Records' Logo & www.coqueiroverderecords.com Website Address, 'Amerzon Flying Bird' Logo, 'DVD Video' Logo, 'Embalagem Reciclavel' Logo, Pressing Code: AF0002000 & Barcode Number/Catalogue Number 7898929 400659. The disc itself also displays several pictures of Morten on the lower part of the disc, we also have the 'Coqueiro Verde Records' and 'DVD Video' Logo's to the left and right hand side of the centre ring. Around the outer rim of the disc is the following Brazilian Distributing and copyright text: '7898929400659 Industria Brasileira - Produzido e Distribuido no Polo Industrial de Manaus por Sony DADC Brasil CNPJ 07.305.913/0001-65. Av. Buriti n.o 2.855. Manaus/AM, sob encomenda da Ecra Realizacoes Artisticas Ltda (Coqueiro Verde Records) CNPJ: 28.124.659/0001-79 Av. das Americas. 700 - Bloco 2 - Sala 331 - Rio de Janeiro - RJ - Todos os direitos do produtor fonografico e do proprietario da obra gravada sao reservados. Estao proibidos a reproducao, locacao, execucao publica e a radioteledifusao deste disco.'. Also included inside of the DVD case is a 'Coqueiro Verde Records' green advert flyer leaflet which shows other Artist's DVDs which are available. There is another, possibly European release of this DVD which was manufactured by Showtime (instead of the Brazilian Coqueiro Verde Records). The quality of this release seems poorer than the Brazilian release. The Design of this European Showtime Release is very similar to the Brazilian Release but with some differences: The disc is black with the title in blue/green and white letter at the top plus the copyright information and logos in white, biut no pictures. The disc and cover include a "FSK 0" logo (on the right hand side of the disc, bottom left hand side of the cover). At the bottom centre of the disc there are 'DVD Video', 'SHOWTIME' and GEMA logos. Printed around the bottom outer edge of the disc is 'P + C 2009 Showtime Movies and Music Ltd. All rights reserved. WARNING: For private use only. Unauthorised public performance, broadcasting or copying is a violation of applicable laws.'. The front cover is similar to the Brazilian release, but the pink circle has the text in English "INCL ALL THE HITS!" plus there is a small white "SHOWTIME" logi in the top right hand corner. On the back cover, the tracking listing is in two columns, rather than one and the format and subtitle information is displayed in a chart form and the playing format of this showtime DVD is region free NTSC. At the bottom of the back cover is the 'Showtime', GEMA, 'FSK 0' and 'DVD Video' logos, plus a smaller sized barcode and some copyright information which reads: 'P + C 2009 Showtime Movies and Music Ltd. all rights reserved, WARNING: For private use only. Unauthorised public performance, broadcasting or copying is a violation of applicable laws. Dolby and the Dolby-D symbol are trademarks of Dolby Laboratories Licensing Corporation.'. There is also a CD 'release' (2000 copies pressed) which comes in a cardboard digipak case and has the same 12 live tracks from the Chile show. It was 'released' by Coqueiro Verde Records (WWW.coqueiroverderecords.com). Also on the back cover are the flying Amazon bird and recycling logos. The artwork of the CD is similar to the DVD. The CD itself differs from the DVD which is black with lots of small live pictures at the bottom. The title is in white and blue at the top. This DVD/CD release is thought to be an unofficial release from Argentina by garra records. There are three different versions, a DVD release, a CD release and a deluxe CD and DVD edition. The text on the sleeve indicates that the show is an historical record of the official presentation of a-ha in Switzerland in 2005 (quote by BBC Music Magazine) and has copyright 2007. 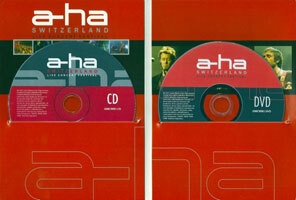 The card sleeve of the deluxe CD/DVD version is red (top), black (middle), white (upper bottom) and grey (lower bottom) with a large outline of an a-ha logo at the top and a smaller white a-ha logo below. Across the middle are three individual live shots (Magne, Morten, Paul) with "SWITZERLAND" printed above plus "LIVE CONCERT FESTIVAL" and a large grey a-ha logo below. "CD+DVD" is printed in red letters at the bottom of the sleeve. The spine and back of the sleeve are also red, black, white and grey. The track listings are printed in black on grey backgrounds down the centre of the back sleeve with some small live pictures underneath. The inside of the card sleeve houses the CD and DVD in pockets on either side. The inside is red with white a-ha logo at the top and title below. The live pictures from the front of the sleeve are printed across the middle. 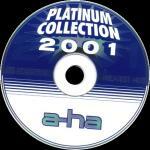 The CD is black (top), red (middle) and white (bottom) with a-ha and the title in white and red at the top, some white text, CD plus catalogue number in the middle and a large faded red a-ha logo plus garra logo at the bottom. The DVD is of similar design but with the red and black switched. The DVD and CD both feature the same 15 live tracks. The DVD only version has a similar cover to the CD/DVD set but with "CD+DVD" omitted from the bottom of the front sleeve, the spine is plain red with white text and the back sleeve only lists the DVD tracks. The inside of the sleeve only has a pocket on the right hand side, rather than both. The disc is the same as in the CD/DVD, even with the CD/DVD catalogue number. The CD version comes in a jewel case. The CD sleeve is a folded paper insert with front cover design is similar to that of the DVD and DVD/CD releases. The back of the front insert is a continuation of the front design without any pictures or text. The inside of the insert is red and black with the track listing in white. 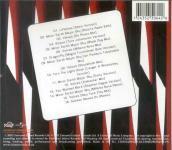 The back cover is mainly white with thinner strips of red, black and grey than on the front. The track listing is printed in the centre of the sleeve. The reverse side is plain red with a dark red log at the bottom. The disc is the same as in the CD/DVD set, with the CD/DVD catalogue number.